What weight paper do I need? If you’re questioning the need for this post, you already know the difference between text and cover stock. But do you know the difference between cover, index, and Vellum Bristol (VB)? How about bond vs. text? We still hear questions about paper all the time, so maybe it’s time for a blog just for that pesky white stuff we print on. We’re still happy to help choose the best fit for our customers, but hopefully this helps ease some frustration about what papers we use and why. First, let’s clarify text vs. cover weight. These are two classes, but alongside text weight is bond (also called writing or ledger). Think of your standard flimsy copier paper. In the same class of cover weight we have index and VB. Think of postcards or business cards. Of the covers VB would likely be thinnest, followed by index, with cover usually thickest. Bond ranges from 20-32lb, or 75-120gsm. Hey, where’d the “lb” measurement come into play? Here’s where it really gets confusing. We can’t just talk about GSM, because standard basis weight is called out in lbs. Lovely. That said, our most basic bond stock is 20lb. The next step up is our 24lb bond, which is what most of our copy jobs run on. It’s slightly thicker and brighter than the base 20lb, and the cost difference is so minimal you may as well print on better stock. Text weight paper ranges from 50-100lb, or 75-150gsm, and includes options for glossy or matte coating in addition to uncoated. We tend to use text weights for letterheads, or perhaps for flyers that will be tabbed shut and mailed. 100lb text is excellent for high-quality posters and art prints. VB cover we carry a lot of different colors in, so brightly colored raffle tickets would be a good fit. We also run certain jobs yearly, and the color designates the year. VB is 67lb BUT it’s 145 gsm so it’s thicker than 100lb text. Stay with me. We tend to use index stock with forms. The manila tag that sticks with a 3-part form, for example, is likely a 110lb. 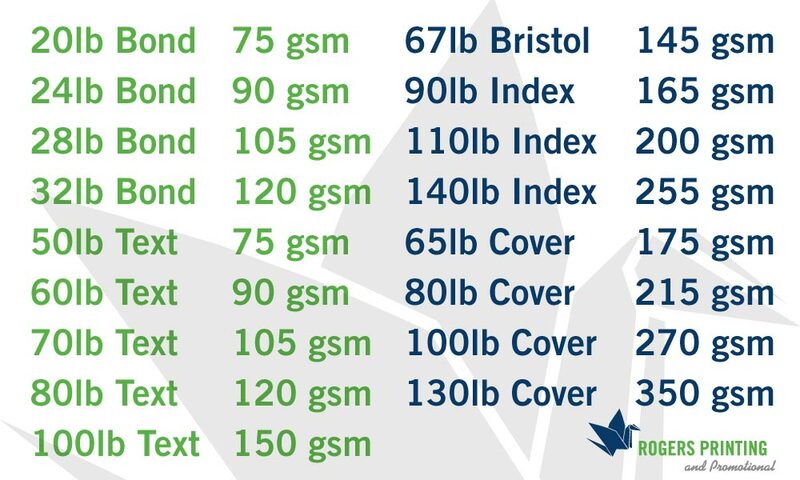 Index options are 90lb, 110lb, or 140lb. The thickest index stock is about 255gsm, putting it right between our 80 and 100lb cover. We carry 80lb, 100lb, and 130lb cover which is 215-350gsm. These also have options for gloss or dull coating. Almost all of our postcards print on 100lb dull or gloss. We like the coating for added protection against the elements, plus ink sits better on coated stock. For greeting cards that fold we recommend 80lb (**Note, 80lb cover is very different from 80lb text, almost double the gsm). A slightly thinner cover stock handles the score and fold better, with little to no cracking. 130lb is almost exclusively reserved for business cards. Use our quick guide at the top of this page to help sort out which paper will work best for you. Questions? Leave a comment or email info@rogersprintingmn.com.